M. Sourioux, S. Bertrand S, JR Cazalets. Physical movements require mobilization of animals’ autonomic nervous system, in order to maintain stable bodily functions while matching the increasing physiological demand. These autonomic responses rely on a coupling between the sympathetic and somatic nervous systems, although how this coupling occurs remains unresolved. To address this issue, we used the in vitro isolated spinal cord preparation from newborn rats, which can be kept alive up to 12 h and generate locomotion-like activity. We found that the stimulation of the muscarinic cholinergic receptors specifically activates intraspinal neural networks generating a slow motor rhythm. 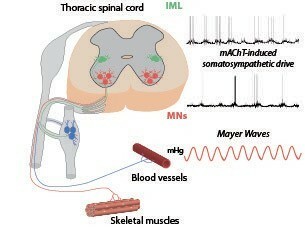 During this slow rhythm, recordings from sympathetic neurons (the cells responsible for the spinal sympathetic output) and somatic motoneurons (responsible for skeletal muscle activity) reveal that both cell types receive a common synaptic input that results in a coupling of sympathetic and rhythmic locomotor activities. This shared somato-sympathetic drive could merge with and modulate the locomotor synaptic drive produced by the lumbar motor networks. We propose that the coupling mechanism we describe here underlies part of the vascular changes needed to maintain adequate muscle oxygenation during locomotion. Legend: During the activation of muscarinic cholinergic receptors (mAchT) in the thoracic spinal cord, a slow synaptic drive is received by both sympathetic preganglionic neurons located in the intermediolateral column (IML) and motoneurons (MNs). This somatosympathetic drive could be the basis of the periodic blood pressure variations observed at rest, the Mayer waves. Here, we investigated intrinsic spinal cord mechanisms underlying the physiological requirement for autonomic and somatic motor system coupling. Using an in vitro spinal cord preparation from newborn rat, we demonstrate that the specific activation of muscarinic cholinergic receptors (mAchRs) (with oxotremorine) triggers a slow burst rhythm in thoracic spinal segments, thereby revealing a rhythmogenic capability in this cord region. Whereas axial motoneurons (MNs) were rhythmically activated during both locomotor activity and oxotremorine-induced bursting, intermediolateral sympathetic preganglionic neurons (IML SPNs) exhibited rhythmicity solely in the presence of oxotremorine. 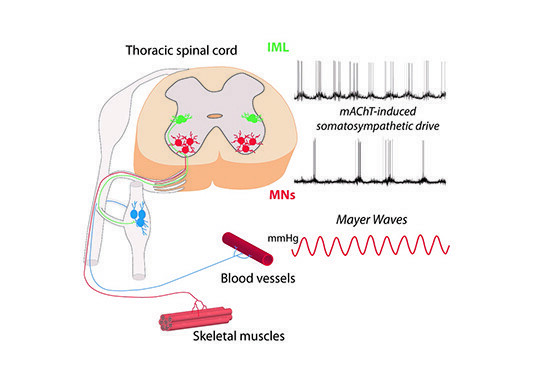 This somato-sympathetic synaptic drive shared by MNs and IML SPNs could both merge with and modulate the locomotor synaptic drive produced by the lumbar motor networks. This study thus sheds new light on the coupling between somatic and sympathetic systems and suggests that an intraspinal network that may be conditionally activated under propriospinal cholinergic control constitutes at least part of the synchronizing mechanism.